Danny's World Rechargeable Hearing Amplifier uses advanced microprocessor technology to deliver crystal clear reception while reducing background noise. Features volume and on/off controls. Includes five silicone tips, storage case and AC adapter. Rechargeable-each charge lasts up to 24 hours. Perfect to use at home, movies, church, restaurants and more. small and comfortable. 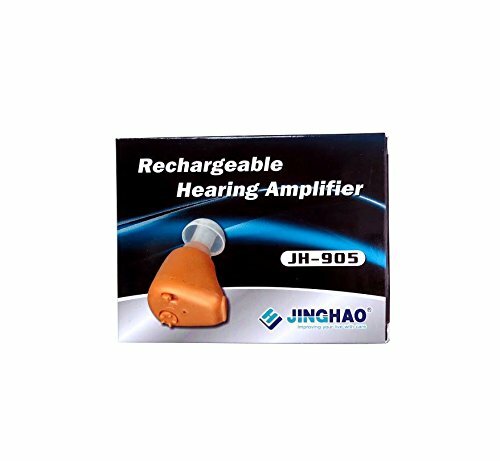 It reduces background noise and helps your hear sounds much better than before! It is easy to operate, lightweight and can be worn on either ear. Volume is adjustable, and it includes 5 sizes of earplugs. It typically takes 6 hours to charge for 55 hours of usage time. It may take up to 10 hours on the first charge.